Munchkin Backseat Organizer Just $6.88! Down From $10! You are here: Home / Great Deals / Munchkin Backseat Organizer Just $6.88! Down From $10! Right now you can get this Munchkin Backseat Organizer for just $6.88 (Reg. $10) at Walmart! Keep your baby’s essentials in order with this Munchkin Backseat Organizer. It features a universal system that fits most vehicles and can be hung simply with the included straps. This Munchkin car seat organizer includes top and bottom mesh storage compartments. It also has three middle compartments, allowing you to store water or formula bottles and other items. Every pouch and section is designed so that your items are easily accessible. This car backseat organizer is made of durable polyester material is easy to clean and maintain. 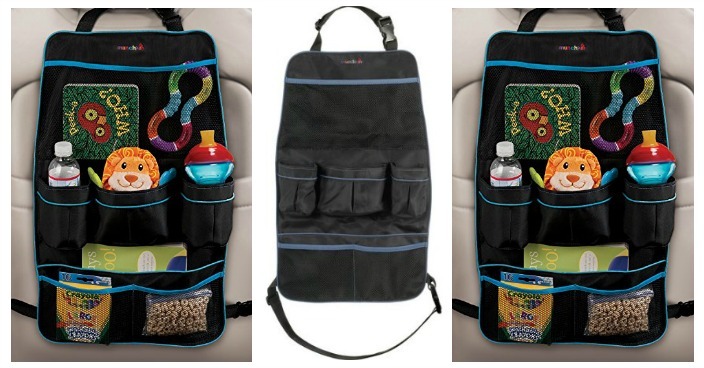 Munchkin Backseat Organizer comes in black with blue trim.